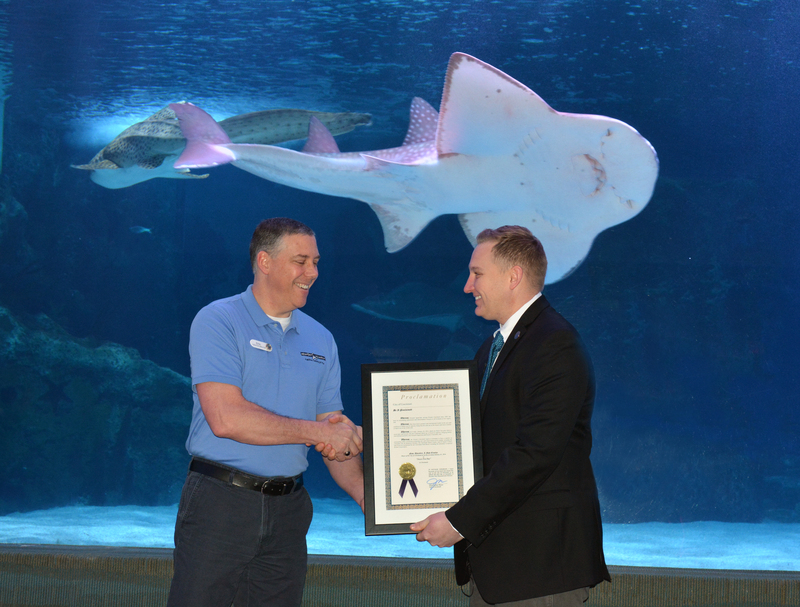 NEWPORT, Ky. – City of Cincinnati Councilman Chris Seelbach on Wednesday morning presented Newport Aquarium with a mayoral proclamation that declared Jan. 24, 2014 as “Sweet Pea Day” in Cincinnati. Seelbach delivered the official City of Cincinnati document to Newport Aquarium Vice President and Executive Director Eric Rose at the Shark Ray Bay Theater. Newport Aquarium VP/Executive Director Eric Rose (left) and City of Cincinnati councilman Chris Seelbach shake hands during a mayoral proclamation presentation. Jan. 24, 2014 marked the day that shark ray Sweet Pea gave birth to seven pups. This historical event was the result of the first confirmed breeding of two shark rays in captivity thanks to Newport Aquarium’s revolutionary Shark Ray Breeding Program. Wednesday marked her first full day back from maternity care at an off-site facility in Newport. Sweet Pea exiting the the acclimation tank and returning to the Surrounded by Sharks exhibit Tuesday afternoon. Additionally, the proclamation acknowledged Newport Aquarium for serving Greater Cincinnati since 1999 as an outstanding educational and entertainment resource to its residents. Newport Aquarium also revealed Wednesday that over the past month since their historical births, all seven pups have passed away, with the final pup passing Monday evening. 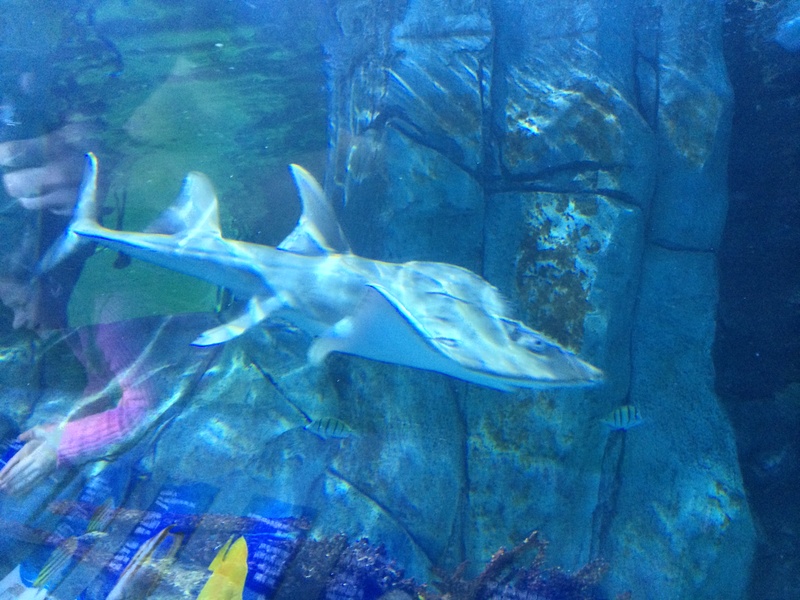 For more information on Sweet Pea and the Shark Ray Breeding Program, visit NewportAquarium.com or call toll free 800-406-FISH (3474). Newport Aquarium, the No. 1 aquarium in the country according to USA Today’s 10Best.com, showcases thousands of animals from around the world in a million gallons of water. Named a 2013 top U.S. aquarium by Travel Channel, Newport Aquarium is a Herschend Family Entertainment company and an accredited member of the Association of Zoos and Aquariums. Newport Aquarium is open to the public 365 days a year and is located across the Ohio River from downtown Cincinnati at Newport on the Levee.